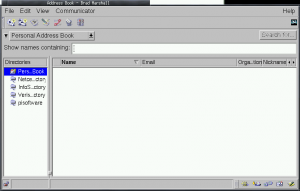 While I was hacking away on my EDS Contacts Integration add-on, I got pretty familiar with the Thunderbird address book. And as it stands, it’s adequate – but adequate like a pickle is adequate for dinner if it’s the only thing left in the fridge. Verdict: the Thunderbird address book is still stuck in the 90’s. It still assumes that your contacts only have one or two email addresses. It doesn’t have any notion of Twitter accounts, Facebook accounts, LinkedIn Profiles, or anything that we would associate with a modern online contact identity. It’s not flexible in the type and quantity of fields that can be associated with a contact. I should start by saying that the following are just ideas that I’ve been tossing around, and it’s still very very early in the design process. This is just a starting point. Feedback is encouraged! The first thing to notice is that the address book is now contained in a tab, as opposed to a separate pop-up window. Next, notice that he tree of “address books” on the left is now gone. I always found it strange to open up the Thunderbird address book, and see that there were…address books inside of the address book. What I imagine instead is that the Thunderbird address book will know about “contact providers”, like Google Contacts, the OSX address book, the Evolution Data Server contacts database, etc. Thunderbird will copy all of those contacts locally for fast searching and processing, and synchronize changes both ways. It’ll also merge contacts that it realizes are the same person. (that’s a ton of work already…). “But wait!”, I hear you cry. “I don’t want my Google Contacts to be mixed with the contacts from my OSX address book!”. No problem – the new address book could have a notion of contact groups. Contacts imported from the OSX address book will belong to the OSX address book. Contacts imported from Google Contacts will belong to the Google Contacts group. And contacts that were common between the two contact providers, and merged, will belong to both groups. Think of it like Google Plus’s Circles – a user can belong to one-or-several contact groups. When we’re editing a contact, the contact list slides away, and we get the full space of the address book to edit the contact. I haven’t exactly figured out what the various editing tools will look like on a contact (especially considering a merged contact where some elements of the contact exist in one contact provider, but cannot exist in another…ugh). So one thing that we’re missing in that last screenshot is a “Cancel” button. Notice that we have those back/forward navigation buttons in the top left. I’m not sure if those are sufficient / clear enough for the job…but suppose the user could just click “back” to return to viewing the contact without having saved it. So I’ve selected a few contacts here, and I can do various things with this selection – like removing the contacts from my address book, or printing them, etc. I can also assign these contacts to contact groups en masse. Highlighting Barry Addison, Bruce Botrill and Phil Cassidy, I can see that all three belong to my “Friends” and “Clients” groups. Notice that the “Baseball Team” group checkbox looks a bit funny – it’s half filled in, which means that only some of my selection belongs to this group. From here, I can just click on the various groups I want to assign these three contacts to. If I click on “Baseball Team”, the half-filled checkbox turns into a check – meaning that all of the contacts I’ve selected will be assigned to that group. Clicking it again would clear the check, meaning that all of the contacts I’ve selected will not be assigned to that group (and will be un-assigned if that already were assigned). And if I were to click that checkbox one more time, then it’d go back to it’s half-filled state, meaning that I’ll just keep the contacts that are assigned to “Baseball Team” where they are, and won’t add or remove any contacts from that group. It’s a tri-state checkbox. Kinda funky, but it’s my current solution. Currently, many operations conducted by the address book are synchronous, meaning that the user interface can feel sluggish while it’s waiting for certain events to occur (like writing contact data to a database). These events should really happen in the background so that the address book stays nice and snappy, and the user can go about their work. This is a big one – any edit or delete events should be un-doable and re-doable. No exceptions. So that’s what I’ve been thinking about. 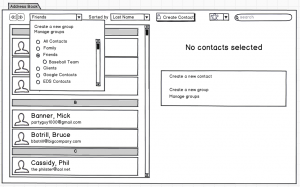 This entry was posted in Mozilla, Technology, Thunderbird and tagged address book, cards, contacts, design, grouping, mockups, mozilla, netscape, thunderbird, ui on August 25, 2011 by Mike. great Ideas. Thanks for your work! I don’t want an Edit-Button. Please make the initial view editable. Changing contact data is much to difficult. I’m using the Thunderbird Addressbook more to enter data than for reading contacts. If I want to call somebody, I don’t open the Thunderbird Addressbook and dial the number manually. I use my smartphone, which is synced to Thunderbird. If I wan to mail somebody, I start typing his mail address in the Thunderbird address an Thunderbird auto completes the address. I never use the address book view for finding an email address. 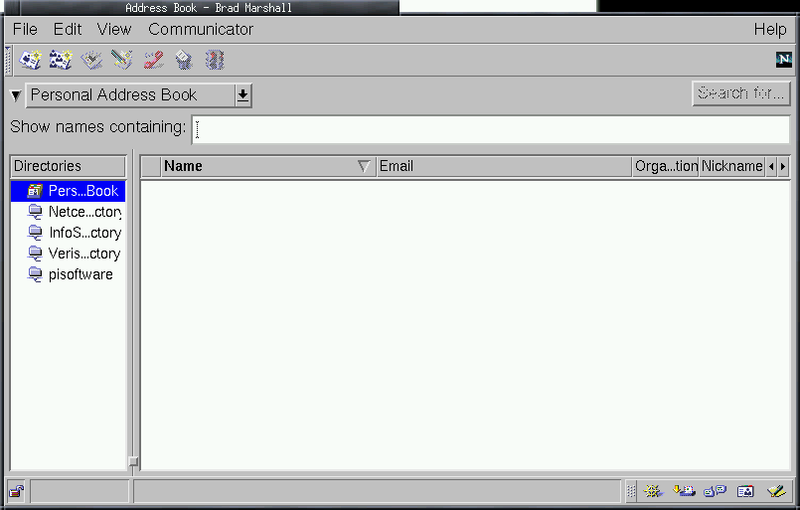 Please think about the Thunderbird Addressbook as Contact-Manager and not as Contact-Viewer. Sounds promising! I want to own my contact data, have it also available in Firefox for mailto: and e-mail field completion (as Contacts in the Browser was going to do), and sync a subset of it to Google. Hmm, whatever happened to http://mozillalabs.com/blog/2010/03/contacts-in-the-browser ? what happened to Raindrop? My largest request, lets be sure to share this work with SeaMonkey and not fork the SeaMonkey impl. I *think* the new design/feel will be best to benefit both of us, and I like the direction you are heading in here. That said, I’m not the Mail Owner for SeaMonkey, so that man may have different feelings. I am surprised that Mozilla Contacts is not getting enough attention and new approaches to solving an ago old problem are discussed. Contacts works perfectly well. The idea is sound and the implementation is good. I did send a mail to a Mozilla Labs developer for the status of the add-on but did not receive a reply. It is nice to have and play with various ideas/ thoughts but abandoning a good one for another does not help. * I hope the address book tab can be also opened as a window (or dragged out of the main window). Instead of displaying an empty panel, show lists with most recently contacted, most used, etc. Makes it easier to find the contact(s) we’re looking for and would probably be all we need 95% of the time. Or maybe make “recently contacted” etc. be special categories/groups that can be chosen from the “contact group dropdown”. * When you create a new contact or group, which underlying address book will it be saved/synched to? All? And what happens when that provider is off-line? Will there be a button to re-sync by downloading and merging again? 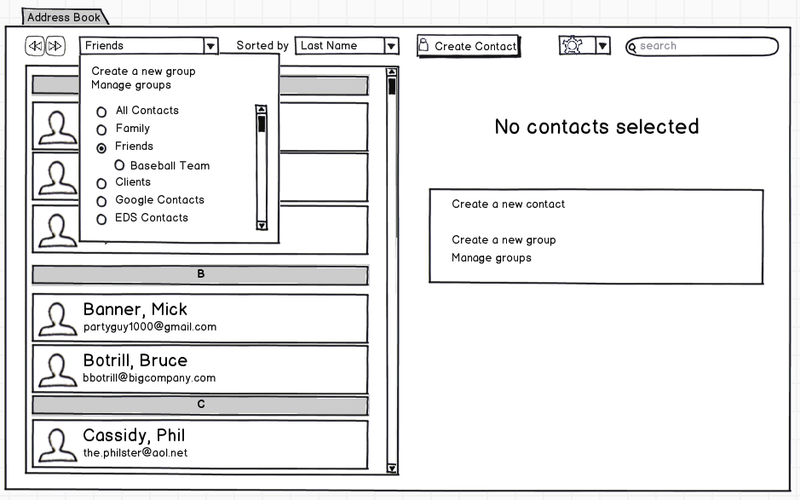 I’m thinking it’s too much work to get it right and maybe it’d be better if all the address book did was to import contacts on account creation (and when the user manually asks for it) and let some other component/application manage syncing with Thunderbird’s own AB database. Add the “More actions” menu-button here as well (next to the edit button): Email contact, find emails mentioning contact, etc. The “Groups” drop-down list should probably be a list of (inline) labels (or links). Similarly, the names and emails fieldsets (and any other info groups) could work just as well (or even better) if they’re not fixed size boxes, similar to how they’re displayed today (see “Contact” and “Work” on your screenshot of the current address book). * Since each contact can belong to many “contact groups”, groups are basically equivalent to tags. Thinking from this perspective, maybe the “contact groups dropdown” could allow multiple selections (AND or OR?). * Clicking edit, I can see how nice sliding away the contact list would look but wouldn’t it be better to open new tabs (that can be ripped out and become windows) so it’s possible to edit more than one contact at once, without going back and forth? * With multiple contact selection, would clicking the “Create a new group” link also add the selected contacts to the new group? I see you’ve focused your design on group management. I hope the “More actions” menu-button includes “Send email to selected”, “Send email to selected (bcc)”. * Maybe consider removing the contact groups dropdown and making the search box more prominent. With suggest / autocomplete and searching both groups and contacts (names, emails, phone numbers, everything) it could very well be easier and better. 1. Search for a name. Realize that the person is not in my contact list. 2. Create a new contact and press OK when finished. 3. Next I want to write an email to this person. Actual behavior: The new contact does not appear in the contact list. First I wonder, “Did I accidentally click cancel, maybe I need to create the contact all over again”. The first few times this happened, I actually created several contacts for the same person before giving up. Wow! This is a goldmine of awesome information. Some of it will need to be addressed in my next blog post, but I’ll do my best to respond to each of you in a few comments. Great ideas and points – I especially like the merging idea. We’ll definitely want users to be able to choose what fields show up in the contact list, and likely to be able to sort that list in a myriad of ways. My pleasure. 🙂 Thanks for your comment! This is extremely interesting information, and just further convinces me that I may have jumped the gun a bit on these designs. I think I need to gain a better understanding of the different ways that people use the Thunderbird address book. I’ve initially stripped out the notion of “spidering out to get Twitter data, Flickr photos, etc” – but I’ve kept the contact provider and contacts-integration idea. Good point – I’ll certainly want to keep Seamonkey in mind during this redesign. Hey – yeah, so as I was saying to skierpage, the Contacts add-on got a serious going-over by me. I’ve picked it up. I’m dusting it off. I’m not sure how much of the code can be salvaged, but the ideas are really awesome, and those ideas were part of the foundation I built these mock-ups on. Again, I find this fascinating, and it just reminds me again that I need a deeper understanding of the different ways that people use TB’s address book. Great ideas! Thanks for posting them! Oh, I like that. We might be able to show some interesting statistics too. Nice. Yeah, it’s a big job to keep all of those address books in sync. You might be right that it might be more trouble than it’s worth. It’s something we’ll have to think long and hard about. That was part of my original design, but I dropped it in favour of the simpler radio buttons, because I wasn’t sure if people would want / need the complexity of viewing their contacts like that. More research required. Yes, that’d be an awesome shortcut – to add the selected contacts to creating a group. And also yes, I forgot the “write to group” button, but that’d certainly be a primary one (as opposed to a More Actions one). Yeah, maybe… I imagine users might be a bit frustrated if they’ve created a group, and there’s no direct way of switching to that group to check the contents. The search bar could provide that feature, but it wouldn’t be necessarily obvious. It’s an interesting idea though. Yikes, yes, that sounds pretty annoying. 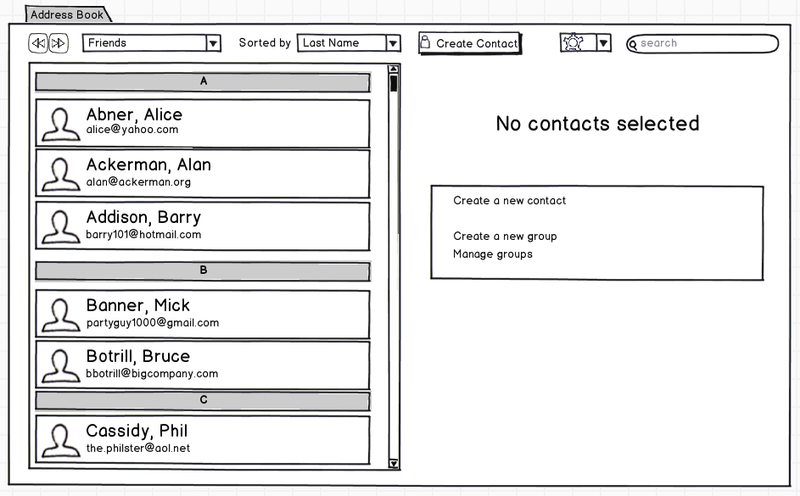 So, sorry to sound negative, but I’m not impressed by a list a of raw design sketches at all when it comes to the addr… er, contacts management. The reason is that I have been around in Mozilla MailNews land for too long to be. We had ideas and concepts floating around for years, we know that what we have doesn’t reflect reality a bit, etc. The fact is also that I rarely ever need the addressbook UI at all. What I need is autocomplete in the To or CC fields of mailcompose. I mostly don’t care about the addressbook UI at all. I also know that doing a cool new UI would be nice, but as long as we can’t get the *backend* to support modern structures, you can paint sketches all you want. And some people have tried to make the backend modern and gave up pretty soon, esp. when they saw how all the other filth of Mozilla MailNews code is tied to this ancient addressbook architecture. Maybe what we need is a completely new backend, I like your idea of centering around contact providers instead of addressbok, and maybe backwards-compatibility should be created in that the old-style addressbooks can also be just yet another contact provider (just like EDS, Google Contacts, Windows or OSX address books and whatever – make this puggable). 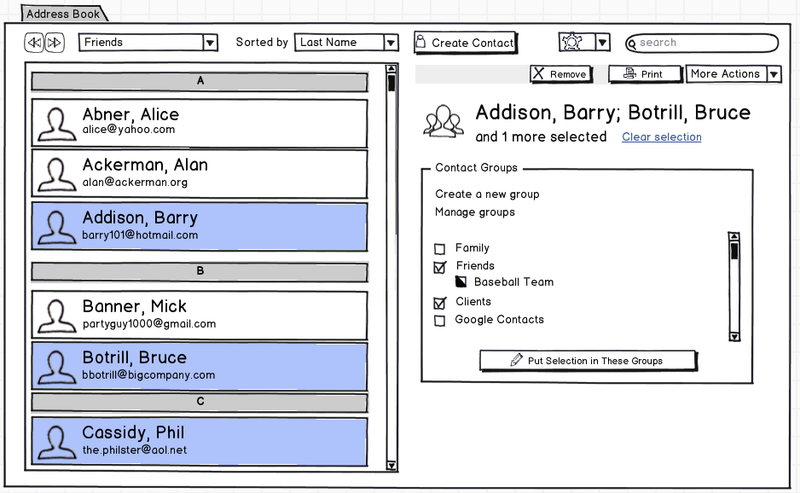 The new backend could support field flexibility as much as the underlying providers do, and support flexible grouping of contacts (something I’ve always disliked in our old architecture, grouping is impossible unless you do a separate addressbook for everyone). Starting off with the basics of that new backend with pluggable contact providers, tying in the old stuff as such a contact provider, make the rest of mailnews work with the new backend instead of the old one, that sounds like a rather larger chunk of work, but I guess that all would point a way out of the mess we have been in for years – and once that takes form, I might get impressed by sketches showing where you can go with it. If it could do a better job syncing with Google Contacts, that would be fabulous. The Google Contacts sync app works very well, but since fields don’t match up, I only edit through Google’s contact interface for fear of messing one or the other up. Problem with the Google interface is that it is really split between “contacts” and contacts under Gmail. I know for a fact that some people would like the ability for nested folders inside an address book rather than just flat (perhaps that could be a nested group/mailing list with ability to hide the flat version of the contact). Hi, super designs. Hope will be applyed on Thunderbird soon. Ah, yes, this is critical. You should check out this post. 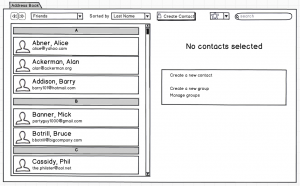 Mmhmm – that was my idea, to help ease the transition from one contacts backend to another. That’s an idea I borrowed from the Thunderbird Contacts add-on from Labs. Nice to see some change on Thunderbird address book. I agree with Joerg about “Thunderbird Addressbook as Contact-Manager and not as Contact-Viewer”. I would like to use TB AB as central database for contact regarless how and on which device I use it. All my contacts info would be gathered in this database. 1. my Iphone has one Adress Book where I manage phone number to call directly my contact, ground mail adress to go to the location thanks to GPS. It also has some e-mail adress to send brief e-mail when I’m out of the office. I don’t use Groups as I don’t know how to manage them on Iphone. I wish I could as I can send same SMS to many contacts. 2. Tb Adress Book is only for e-mail address. I use group of contacts to send mass mailing. Phone number and ground mail adress is useless as I don’t know at present how to use directly it in TB. 3. In case I’m working at home on my private computer I’ve another TB Adress Book with a mix of private and professional contacts. 4. Google mail has also another contact adress book as I use as a backup e-mail address GMail but only with limited number of contacts. I don’t like Google to know all my contact. I assume Apple got them somehow through my Iphone it but I can’t avoid it. None of those adress book are synchronized neither merged. That is to say that info can be outdated in the IPhone for e-mail adress but not in TB AB. And same info could be on different contacts because I made a mistake while keying in info at home and not at work. Info could be aslo different because at home private contact got Nickname whereas professionnal contact is always Name and Surname. Contacts Mozilla Labs seems great to me. I always wanted to test it but I don’t know how but it has never been available for my TB version. From time to time, I try to support TB project and I installed some beta version for testing. But still, impossible to use this Add-On. I like the concept of this add-on because it seems to merge and synchronize all my contact regardless where they are coming from. Moreover I can choose which info to synchronize. Facebook will never have any of my AB info. In fact a mix on Contact add-on + Sync add-on would have been great. 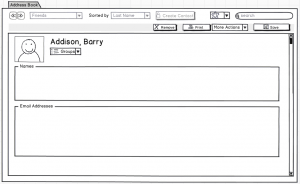 Contact Add-On to build up my contacts database where all info are managed. In 2010, I mailed Mixed Puppy developper about using Weaver for TB contacts and why not Calendar. At that time, it was only about getting sync to work with TB regardless what was in the synchronization. It is unusual for me to use TB AB as Contact-Viewer. On TB I just use auto complete mail adresss 99% of the time. A kind of Gloda search would be great. If not I usually mispell mail address. 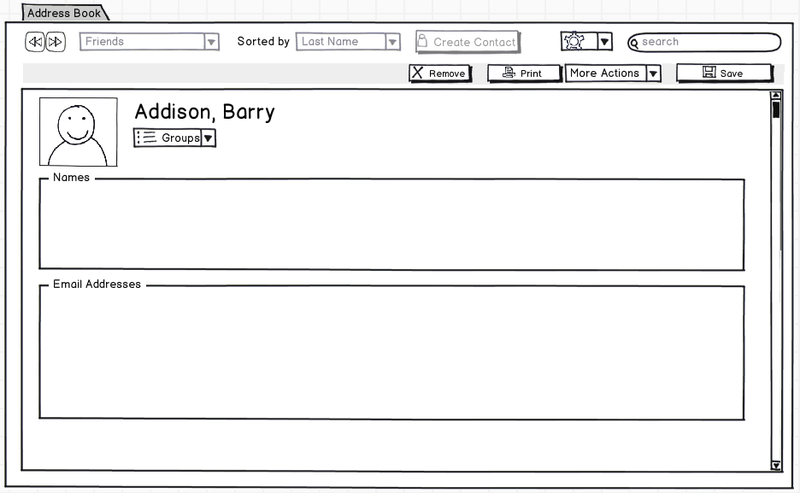 So first step Add a contact and then add or modify relevant field. I never understood why I had many Address Book on TB. Leave the addressbook tree in the view, it’s essential for moving contacts by drag and drop. Furthermore, multiline contact listitems take too much space. Your mock up does focus on real people only, but there should also be a way for managing/displaying institutional addresses in categories like restaurants, shops, service-hotlines, news-letters, etc. There should be the option to display address information in different ways also for cultural differences, e.g. other country – different layout of postal address. There were some lengthy postings/discussions (me included) about the subject “address book” and ideas on the developer news group last year. I use my address book and sync it with my phone with Funambol, so I store into it all my contacts details. Some of them (my grand mother for instance) don’t have any mail address! Then I need to edit “Mr” contact, copy past “A new street”, then “New postcode”, then “New City”. After that I need to do exactly the same for “Mrs”. I would like to be able to select Mr and Mrs and to edit their address, phone number and some other thing (phone number) in one step. Exactly like you can do with mp3 tag. It would save me a lot of time. Pingback: Linux Blog » Blog Archive » Návrh nové podoby správy kontaktů v Thunderbirdu? I like lots of the other suggestions. What I’d like most is to be able to sync unique Tbird address books that reside in different profiles (i.e. on different computers) – not overwrite as is currently the only option. In the best of all possible worlds, you’d end up with a combined list with no duplicates. Not sure if this is/could be part of your vision, or if it needs to be a separate capability, or even an Add-on. Hope you code guys figure this one out! Thanks for all your work. I think that’s the way to go. It would be super cool to have different backends for Thunderbird’s addressbook. 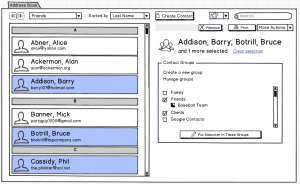 That way Thunderbird could work perfectly hand in hand with Groupware solutions like Horde (well, Turba [http://www.horde.org/apps/turba/]). 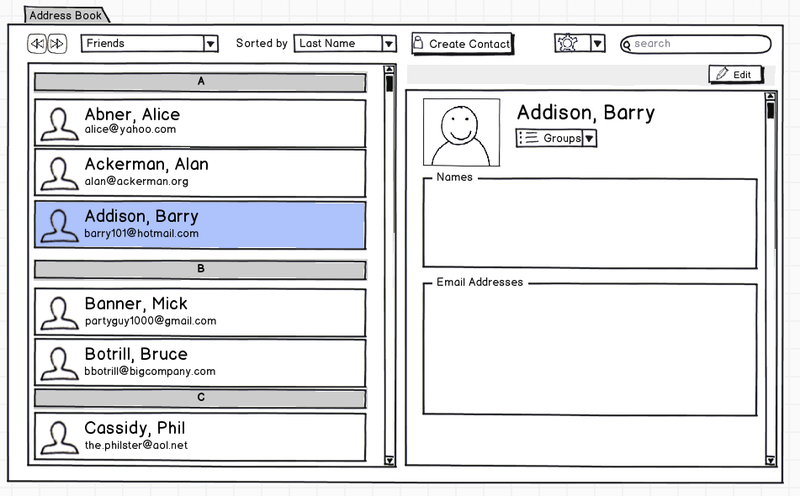 To be be able to work with the same contacts via a Web-Interface and a native client like TB would be truly amazing. is inability add/edit items in LDAP addressbooks and support for only two e-mail addresses (and related Mozilla AB LDAP schema). IMO without this thunderbird or seamonkey will remain only toy for home, Firms and organizations. nor SOHO sphere will not accept it. Claws mail is much better in this view. I confess I didn’t read all comments, so if this has already been said, forgive me. I manage a small network with an LDAP server to auth all services. As you could imagine, I use it as a corporate address book. Whenever I send a mail to someone from my LDAP, TB saves it on a local AB. Then the guy goes to another challenge in its professional carreer (quit, fired, whatever), and its email address is no longer valid, but it still exists on local AB. Would be nice to have TB NOT copying contacts from external AB to local AB, unless you say so. This just reeks of bikeshedding. Get the low hanging fruits first. 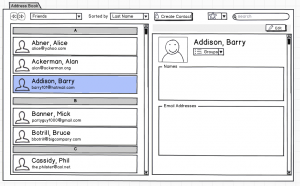 Get CardDAV and/or LDAP working. Get rid of the weird behaviour/display bugs when editing contacts. Then, when the basics are in place, discuss looks. I’ve got more thzn 30 different Adress Books in Thunderbird. Looks really nice. If you can make this happen, please do it. Can’t wait to see this happen. My biggest issue…. I use contacts for all information including addresses and phone numbers. So I look them up frequently in the address book. But I can’t. I have contacts (personal & business)associated with different email accounts. I want to keep them that way. If I want to look them up in the address book, I have to look through each email account individually. Just a couple of thoughts. I agree with the need for more than two email addresses. Should be allowed to add as many as you like per contact, which would probably mean a separate database table for email addresses. Ditto phone numbers. I have several friends with two mobile numbers, so I put one in Mobile, and one in Home, which is unsatisfactory. Fields for Skype / Yahoo / MSN ids also needed. Shouldn’t take up screen real estate if they’re empty though. Should be able to export and import in .vcf file. Especially being able to save/export entire address book to a single .vcf file (as opposed to one file per contact). Have you come across the “more functions for address book” extension? It seems to have a lot of the above features in it. The Address book for me is just a way to edit and update my contacts. I don’t really care too much how it looks. On my PC I just need it to be able to autofill email addresses when I need them. Here is my single key requirement: I sync Thunderbird with a funambol SyncML server, and this syncs back to my notebook and my mobile phone, and my Gmail account. All three devices are more or less in sync and have the same info. This is absolutely key for me, and the more mobile devices we all accumulate, the more important this syncing is going to be. I don’t really care what mechanism I use to sync them all, but SyncML seems to be the best support on phones. PS. I also make use of the Address book de-duplicator extension, which is very handy when you first merge all your contacts from all your devices. wow– this is awesome! I am so glad you are doing this. 1. Date created and date modified stamp on every field in every entry, and on groups. 3. Optional system for forced entry user-generated fields. Using TBird 9.0.1 on Win7 and OSX … managing personal address book with 2000+ contacts. I use the gContactSync extension to extend the capabilities of TBird AB, which has helped address some issues like dupes (use merge in Google Contacts), etc. It enables custom fields but leaves much field mapping up to the user, and that’s both a lot of work and a source of incompatibilities. Key point made by others: AB is no longer just a name and email address manager, but needs to be a full-scale contact manager for all online and offline connections. Big job and constantly changing. I have found using groups to segment a single master contact list the most useful approach. But AB needs more tools to manage master list to groups and back. 3) Agree direct edit of initial display; so many contacts, so little time to add/edit and update. 4) Support for cloud storage and synching of contacts. I use Google for this now, but there are lots of other choices. TBird should get ahead of this. I only saw one comment that mentioned a problem with multiple people with the same address. I would like to use one address book for everything, including mail merge for Christmas cards, and I can’t use Thunderbird’s address book(s) for that right now without duplicating contacts. I need a way to end up with labels that say “Mr. and Mrs. John Doe” or “Mary Smith and Jane Doe” or the like. I’m not sure if *any* address book/contact list has this feature, but I think it would be great if there were a way to have separate entries for individual people but to be able to associate those entries as part of a household, so that you could have a view that lists only households and their postal addresses for the sake of mail merge. (This view could also weed out contacts with blank addresses.) Such a feature would also allow the previous commenter who wanted to edit a couple’s address in one go to do that. For what it’s worth, while *I* specifically want this for Christmas cards, I think it would be potentially good for mail-merging business mailings as well, especially for consumer-sales-oriented businesses. Great ideas! I am mainly interested in being able to sync (and merge) the Thunderbird Address Book on one computer with a Thunderbird Address Book on another, remote, computer. So if a Thunderbird add-on could include that functionality, it would be wonderful. Mike, any idea of the roadmap for the new Address Book?